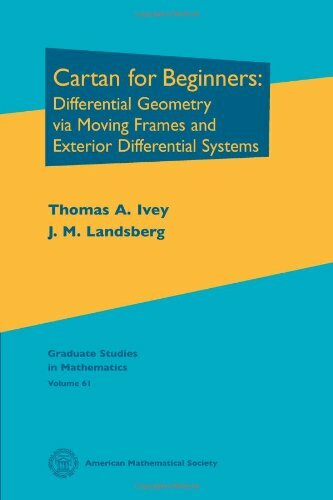 [PDF] Cartan for Beginners: Differential Geometry Via Moving Frames and Exterior Differential Systems (Graduate Studies in Mathematics) | Free eBooks Download - EBOOKEE! Description: This book is an introduction to Cartan's approach to differential geometry. Two central methods in Cartan's geometry are the theory of exterior differential systems and the method of moving frames. This book presents thorough and modern treatments of both subjects, including their applications to both classic and contemporary problems. It begins with the classical geometry of surfaces and basic Riemannian geometry in the language of moving frames, along with an elementary introduction to exterior differential systems. Key concepts are developed incrementally with motivating examples leading to definitions, theorems, and proofs. Once the basics of the methods are established, the authors develop applications and advanced topics. One notable application is to complex algebraic geometry, where they expand and update important results from projective differential geometry. 2018-01-19[PDF] Programming for Beginners: Fundamental Basics of C , Java and Python. Start programming right now! No comments for "[PDF] Cartan for Beginners: Differential Geometry Via Moving Frames and Exterior Differential Systems (Graduate Studies in Mathematics)".